YATSUSHIRO, Kumamoto—Takumi Kajisha had a career many would envy. Until he gave up his job in an air-conditioned office for one on a sun-baked dirt field. 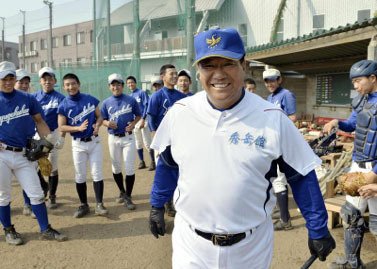 At the end of March, Kajisha quit Panasonic Corp., where he had risen to the position of senior managing executive officer, to become the manager of the baseball team at Shugakukan High School in Yatsushiro. While working at the electronics giant, Kajisha also served as a coach for several amateur teams. It was another side job, along with his lifelong dream to lead a team to the national high school tournament at Koshien Stadium that led him to start a new life in an unfamiliar city in Kyushu. “It’s the spirit of adventure,” Kajisha said of the reason he quit Panasonic to manage high school baseball. Kajisha, 62, played baseball at both Gifu Commercial & Business High School and Waseda University. After entering Matsushita Electric Industrial Co., the former name of Panasonic Corp., he played on the company’s baseball team as an outfielder. He later became the team’s manager and also served as manager of the All Hirakata Boys, a middle school baseball powerhouse in Osaka Prefecture which he lead to many titles. While steadily climbing the corporate ladder at Panasonic, assuming jobs such as executive officer of the Groupwide Brand Communications Division, Kajisha maintained his interest in Koshien, landing a gig as a commentator for NHK broadcasts of the spring and summer tournaments. Kajisha’s insightful comments attracted the attention of Shugakukan’s president. The school has participated one time each in the spring and summer tournaments at the venerable Hyogo Prefecture stadium, but has not qualified since spring 2003. Kajisha showed right away he regards the job as serious. His first order to the team was, “Buy rain shoes.” He wanted the players to be resolved to practicing even on rainy days, as preparation for the possibility of rain falling during a game at Koshien in the future. Kajisha, relocated to Yatsushiro with his wife, now thinks about baseball from morning until night. “I want to show that people can pursue their dream even after turning 60,” he said.